Gyldenhul Barrow is a small burial ground located on an island off the Felsaad Coast. It is, without a doubt, the single richest treasure trove in all of Solstheim. The barrow's door is locked. 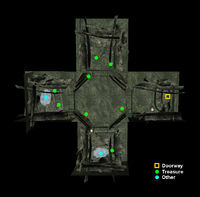 The key for the door is obtained from Thormoor Gray-Wave as a reward for completing The Cursed Captain quest. The name Gyldenhul translates to "Golden Hollow", or "Golden Hole" in Danish which would explain the large amounts of treasure found within. This page was last modified on 19 August 2013, at 05:29.